In Britian, Damon Albarn is well known as the lead singer for Blur and leading light in the Britpop movement of the mid-1990s In the U.S., he’s more familiar to people as his alter ego “2D,” the lead singer of ground-breaking animated band Gorillaz. 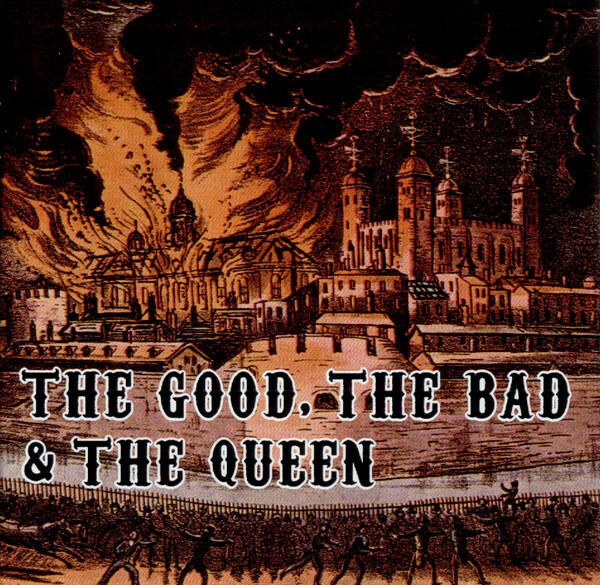 However, on both sides of the Atlantic, his work on The Good, The Bad & The Queen, a collaborative alt-rock ode to London, is often overlooked—and that’s a shame, because the 2007 album is a gem that seems to shine brighter every time you marvel at it. Technically, The Good, The Bad & The Queen was recorded by a nameless band, although the artist is listed as “The Good, The Bad & The Queen” on iTunes and other music listening services. Why the lack of a name? Judging by what has been said in interviews, it seems as if the choice was intended to reflect the idea that the album’s content—a study of the light and dark sides of Britain’s most iconic city—is more important than the musical clout of its creators. Of course, it’s impossible to overlook just how distinguished every member of the group is, though. There’s Albarn, the vocalist and lyricist known for switching gracefully between musical projects like a high school student serving as president of five clubs. Then there’s Paul Simonon, bassist of iconic punk band The Clash, Simon Tong, acclaimed guitarist and keyboardist of The Verve (which brought us “Bitter Sweet Symphony”); and Tony Allen, drummer for Fela Kuti’s legendary Africa 70 and a superstar of the Afrobeat genre. With such an accomplished group of musicians, it’s no wonder that The Good, The Bad & The Queen is the kind of album you keep coming back to. One of the key features of the album is the lyrical diversity present in its tracks. Since all 12 songs speak of London, you might expect that the album gets thematically redundant at times, but that’s far from the case. The lyrics cover a variety of topics, from the good to the bad to… yes, the Queen. At first glance, it may seem that “the bad” gets the most coverage due to songs like “Northern Whale,” which tells the story of a (real) whale trapped in the River Thames, and “Kingdom of Doom,” an apocalyptic wartime song. However, “the good” is there as well, peeking through like the beginnings of plants growing through cracks in the pavement. You can see it in the confidence of the phrase “Not gonna be a victim!” in “Three Changes”; the blissful recollections of a happy moment in “Behind the Sun.” Truly, the album bears a subtle undercurrent of hope—hope that by ruminating on the problems of the past, both political and personal, people can work toward a better future. Musically, The Good, The Bad & The Queen is just as intriguing as it is lyrically. A common thread of string instruments, delicate piano plunking, and a foreboding vibe runs throughout much of the album, but every track has its own unique sound. Each musician’s distinct style and background can be heard in different songs. For example, “History Song” sounds a bit like Gorillaz’ “El Mañana” due to its memorable acoustic riff, haunting vocals, and somber ambience. On the other hand, “Three Changes” is a close cousin of The Clash’s “Armagideon Time,” considering its similarly social-justice-themed lyrics and reggae-influenced sound. The album truly is a product of its creators, which should please fans of all four of the band’s members. Also notable about the album is its intricate instrumentation, which gives each song an intensely immersive feel. Small touches like the soft ringing of bells in “Kingdom of Doom” and the faint noise that could either be a siren or the wind in “Behind the Sun” create a cinematic atmosphere that seizes the listener’s attention and emphasizes the emotion in every lyric. The Good, The Bad & The Queen is not the kind of record you should take in idly. This tribute to a “stroppy little island of mixed-up people” isn’t just for Londoners—it’s ideal listening for anyone in need of a sometimes harsh, sometimes uplifting, always realistic evaluation of society. Ten years after its release, the album’s themes—fear and submission in the face of violence (“drink all day ’cause the country’s at war”), vanity and carelessness (“living in magazines/not looking for a reason”), desire for consolation in rough times (“Lord, can a stone be ballast for/an aching soul?”)—are still as relevant as ever. In that sense, the land that Albarn sings about on the album serves as an apt microcosm of the world at large.